F1 isn't the most humorous of sports. Then again, most sports aren't particularly amusing. With the possible exception of synchronised swimming, that's just plain hilarious. Despite the po-faced attitude towards sports, there have been attempts in the past to bring some levity to the proceedings via the medium of video games. Dating back to Sensible Soccer through to Blood Bowl, with a side step to Mario Strikers Charged Football, there have been many games that attempt to capture the core of a sport while trying to raise a chuckle with its player base. 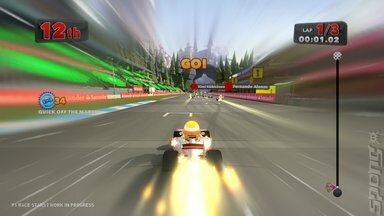 Some have been more successful than others, and F1 Race Stars is the latest title to try that very thing with one of the most serious sports out there: F1 racing. 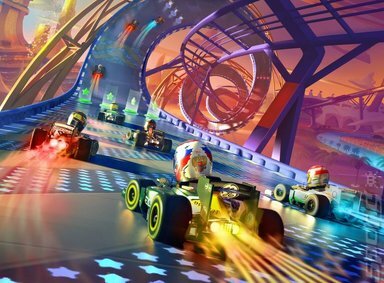 Announced earlier this year, F1 Race Stars is a kart racing game in very much the style of the later incarnations of Mario Kart and Sonic & SEGA All-Stars Racing. The key difference being that this is based on the F1 2012 racing license. So rather than fantastical racing vehicles, all players are sat in a miniature F1 car that resembles a go-kart. 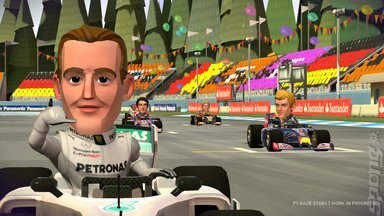 All of the drivers are represented with bobble-head-like versions of themselves to reflect the cartoon-like styling of the game. 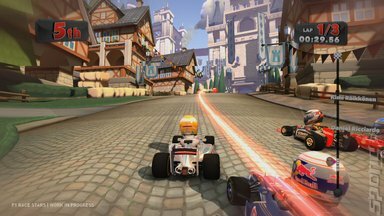 The cartoon style doesn't end with the graphics, as the tracks upon which the karts tear around aren't your normal F1 fare. They undulate quite a lot, have jumps, heavily banked curves and even shortcuts. It's fairly safe to say that this game isn't for the F1 racing purist. But despite this cartoon influenced interpretation of F1, there are aspects of the sport that have remained within it. That being the use of KERS and DRS as well as the presence of the pit lane. KERS (Kinetic Energy Recovery System) is implemented in F1 Race Stars by allowing the player to pump the accelerator around certain highlighted corners and thus energise their KERS. This results in them catapulting out of the corner at great speed in a manner similar to how KERS is used in F1. DRS (Drag Reduction System) is used as a power-up that is somewhat like a temporary shield that prevents your car from being subjected to any of the negative power-ups the other drivers have littered the course with. 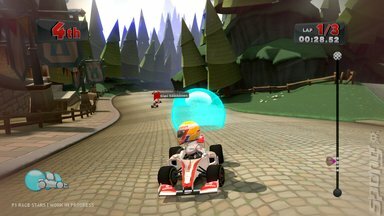 For yes, there is indeed the power-up mechanic in play here with large spheres acting as traps for unsuspecting drivers to become trapped in for a short period. Think of Patrick McGoohan in The Prisoner being captured by Rover and you're pretty much there. Interestingly enough the FIA, the governing body behind F1, did not place too many restrictions on how F1 was to be represented, but the key one they did insist on was the fact that the cars could not explode. Damage was fine, but all-out destruction was out of the question. To overcome this Codemasters has developed a de-buff system in which when a player's car is damage the top speed is decreased significantly and they can only be repaired once they pass through the pit lane. 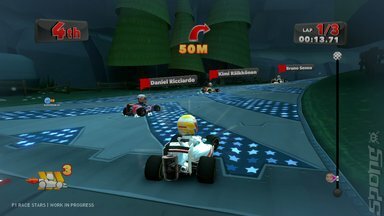 F1 All Stars is as fun a game to play as it is pleasing to look at. While the build we had time with was in Alpha, it showed much promise. It will be appearing in November 2012 for the PC, PS3 and Xbox 360 priced at £30.